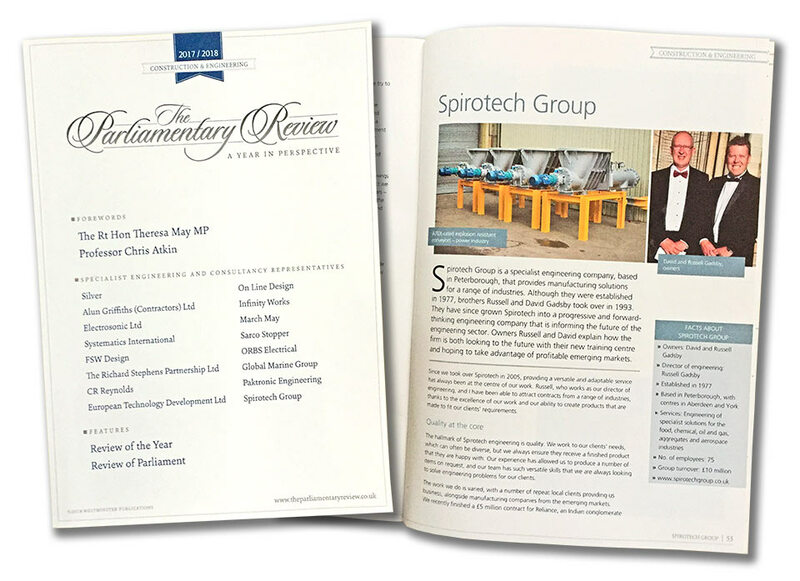 This year has been an exciting year of progress and growth for the Spirotech Group and the company was recently invited to contribute to the prestigious Government publication The Parliamentary Review. Chaired by Lord Pickles, former Conservative Communities Secretary, and Lord Blunkett, former Labour Home Secretary, The Parliamentary Review is a series of independent publications which aims to share best practice among policy makers and business leaders. Each edition of The Parliamentary Review focuses on a key governmental policy area and Spirotech Group Director David Gadsby shares his personal insight in to the current state and future prospects for the Construction and Engineering sectors. By combining commentaries from cabinet ministers, government agencies, associations, trade bodies and award-winning journalists along with innovative thinking from industry experts, a wide range of viewpoints are presented. The Parliamentary Review provides a comprehensive summary of the past year and a reliable template for the year to come. Download the Spirotech Group review (PDF). Spirotech Group is a specialist engineering company, based in Peterborough, that provides manufacturing solutions for a range of industries. Although they were established in 1977, brothers Russell and David Gadsby took over in 1993. They have since grown Spirotech into a progressive and forward-thinking engineering company that is informing the future of the engineering sector. Owners Russell and David explain how the firm is both looking to the future with their new training centre and hoping to take advantage of profitable emerging markets. Since we took over Spirotech in 2005, providing a versatile and adaptable service has always been at the centre of our work. Russell, who works as our director of engineering, and I have been able to attract contracts from a range of industries, thanks to the excellence of our work and our ability to create products that are made to fit our clients’ requirements. The hallmark of Spirotech engineering is quality. We work to our clients’ needs, which can often be diverse, but we always ensure they receive a finished product that they are happy with. Our experience has allowed us to produce a number of items on request, and our team has such versatile skills that we are always looking to solve engineering problems for our clients. The work we do is varied, with a number of repeat local clients providing us business, alongside manufacturing companies from the emerging markets. We recently finished a £5 million contract for Reliance, an Indian conglomerate who work in energy, textiles, retail and telecommunications. We were contracted to produce pressurised screw conveyors at the pre-manufacture stage, which would then be used in the chemical industry. All our engineering is done in-house. This way we are able to ensure the quality of our work which allows us to secure repeat business. We work on a range of long and short-term contracts, which provides security but also allows us to continue to work with new clients. A key strength of our service is our ability to respond to the market. Engineering is constantly changing and we understand and embrace it. The rise in the use of technology means we cannot sit back and relax. Instead we continue innovating and developing our skills. Our rigorous in-house training centre is key to ensuring the quality of our engineering. When engineering students leave college or university, they have basic knowledge and skills, which our training helps to fine-tune. In addition to opening a new training centre, we have applied for planning permission for a new factory that will increase our workforce by 25 per cent. This will allow us to develop our own talent and ensure our quality standards will be continued. The training moulds young engineers, providing them with knowledge of the exact requirements of a day-to-day job in engineering. It will allow them to synthesise what they have learned, but also develops skills in their repertoire. When we started there were only 12 employees, initially a mix of old and new engineers. Only two or three have remained, however, from before the takeover. Some have retired, but it is important to note that some failed to adapt to the constantly changing demands of the role. In the future, we expect to see more machinery operators who have a greater knowledge of technology, working alongside engineers. We do not shy away from these changes and we will look for a different kind of employee in the future, alongside the new training centre. As changes happen, which will likely be in a piecemeal fashion, we want to develop a business culture that can evolve seamlessly. Our training programme is focused on welding high-end alloys. As a result of the costs associated, this is a skill that many students won’t learn at college or university. Our training centre in Peterborough should be able to accommodate 20 people at any one time, and will offer training to both our employees and other companies. We see this as a great opportunity for new business and relish the opportunity to be seen as industry leaders, driving for further expertise in the engineering sector. By bringing basic skill levels up, we are building on engineering education previously acquired at college and university. The last three years have been a great period of growth, where our turnover has nearly doubled. A key area, aside from the emerging markets, has been with clients within the water industry. This includes Yorkshire Water, Scottish Water and North West Water. We mainly produce powder handling instruments, and the increase in enquiries from companies in the same industry is testament to the quality of our work. Our larger clients include Weetabix, Coca Cola, Airbus and Nestle. With Weetabix, we have recently manufactured high-end alloy cooker screws, our partnership spans 20 years. Initially, we undertook smaller projects; this has since snowballed, and, while we work on a case-by-case basis, they know and trust our work, which is why they keep coming back. We bang the drum for the quality of British engineering. British standards are an exportable commodity, and have come to represent a hallmark of quality. Our international business is well-established, especially within emerging markets, and will allow us to move to a larger factory – subject to planning permission. It has also been a key part of our recent growth, which allows us to further develop our staff and equipment. It is difficult to gauge the effects of Brexit from our position. While we do business in France, Germany and the Netherlands, even those markets have their own agenda. Recently, we manufactured a large vessel for a French company, and while standards are meant to be harmonised within the EU, they still sent inspectors over to check the products were to their own standards. Protectionism still exists, even within the EU, and often more so than when dealing with emerging markets, who embrace the quality of our work. We are concerned about trade tariffs and the free movement of goods, as changes could increase our cost base. Cross-border recruitment is another concern, as we currently employ 20 non-UK EU citizens. Our export business was secured without government help, but we think assistance should be more readily available. Every export deal is unique and the support has to be made to measure. Given that many companies have never functioned outside the EU, government assistance will be necessary to avoid a detrimental effect on the UK economy.